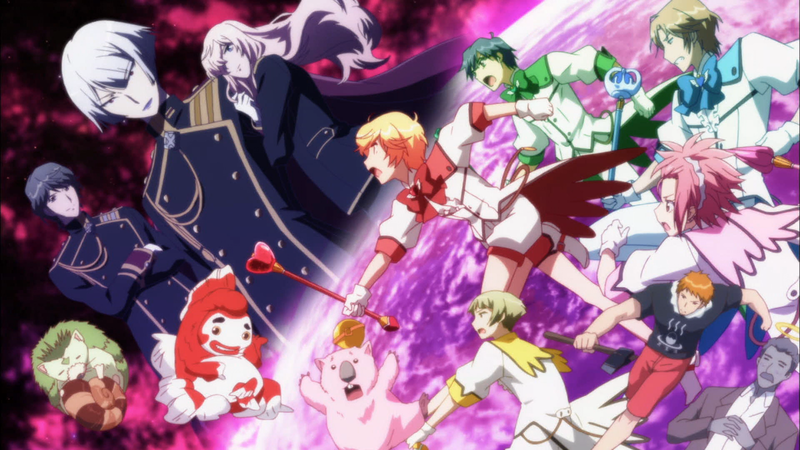 Review/discussion about: Cute High Earth Defense Club LOVE! Earth Defense Club follows five high school guys – Yumoto Hakone, Atsushi Kinugawa, Io Naruko, En Yufuin, and Ryuu Zaou – who are one day visited by an alien life-form known as Wombat. Upon his arrival, the men are forced to become the “Battle Lovers,” using their newfound powers to bring warmth and happiness to their fellow students turned monsters. “Magical girl” anime are a staple of the medium, and are really only possible under its format. Thus, Earth Defense Club capitalizes on this very idea. En, Yumoto, and the rest are themselves “magical girls,” but it becomes pretty apparent that the show isn’t truly about this subset of anime. Instead, it’s the parody that it generates that gives it its distinct edge. The shiny transformations are plenty, the corny one-liners are in full-force, and the enemy happens to be winning until the group (eventually) unleashes their super, “all together now” move to save the day. It knows exactly what it wants to do at all points throughout the series, because it targets so many different facets of what it is poking fun at. Delving into so many areas that make up this genre, though, leads to an inherent problem: distinguishing the intentional parody from what it is legitimately trying to do. Because calling everything that the anime does “as part of the parody” makes it seem like it can do whatever it wants without ever being in the wrong. For example, the show is quite repetitive in its presentation, with a new monster to defeat per episode. The lead up to the victory might be slightly different – a small argument between friends disjoints the group, the enemy is defeated literally seconds after arriving instead of prolonging the fight, etc. – but witnessing the same conclusions day-in and day-out don’t reinforce the message of love it’s trying to get across. Instead, it only hurts it by revealing its inability to explore all sides to the subject it is tackling. On the other hand, the anime’s “plot twist” at the end coincides with its original goals of being not just light-hearted but carefree in terms of coherency. By being so ludicrous in its narrative, it allows the audience to understand that the show still understands where it initially came from. The aforementioned repetition is a bit more rampant than the unique scenarios like the conclusion, so the overall effectiveness at being a parody isn’t as strong as it could have potentially been. Still, not all of the repetition works against itself. More specifically, there are two venues in which it leans in its favor: the casual conversations and the bathhouse. The former is strange due to how normal it comes off as being. The club members often have “Seinfeld” discussions, or talks involving the most basic of concepts. They might make a comment about the food they like to eat, the interests they have, or about what it means to be mature. While the dichotomy between the down-to-earth talks and the silly, “magical girl” moments contrasts nicely, it’s the connection between the two that’s the most important. For the “Battle Lovers” might seem to have random conversations when in fact what they say between each other directly leads into the problems at hand. Meaning their everyday words are not just relatable but contextually relevant, too. The second venue gets a bit more esoteric, but it is alluded to. Looking at the show as a whole, nearly every set of events includes a bathing scene at the bathhouse. Why? Is it just to show the men naked as much as they can? Or is there a deeper meaning? It turns out its both. Of course, it’s supposed to be a bit of fan-service. But there is an important detail about the bathhouse; it’s Yumoto’s and his brother’s. Considering his position as the masthead of the group (and his brother’s former status as the greatest “Battle Lover”), the bathhouse is a metaphor of love. Baths are warm, quite relaxing, and bring about a sense of comfort. Love is the same way; when it’s received, when one bathes in it, it induces heightened elation as a result of these very same feelings. The final move is even entitled “Love Shower,” implying the gentle and water-like substance that love tends to be. Thus, the guys who daily cleansed themselves in the baths they adore so much weren’t just destined to become champions of love; they were surrounded by it for longer than they ever knew. Earth Defense Club doesn’t boast the best of art styles. It’s rather boring to look at, with the same drab club rooms, the overused school locations, and the bathhouse that has nothing but the previously mentioned love-water. In other words, the repetitiveness does not help the anime whatsoever in this circumstance. The character designs are fine for what they are, and may even be a parody on their own. 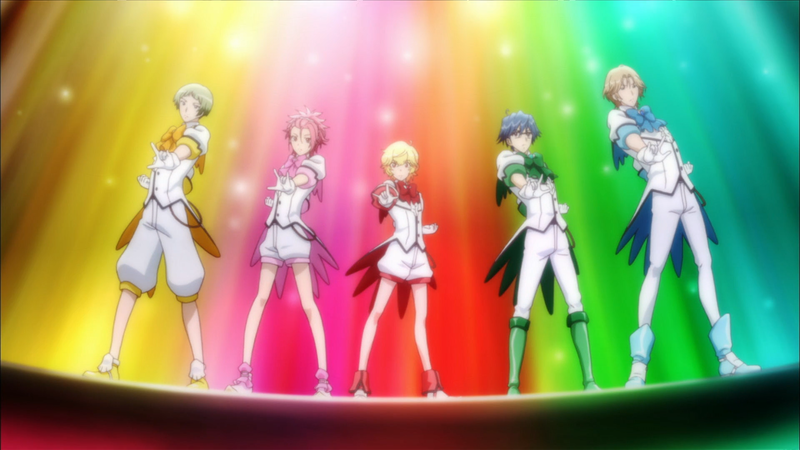 Each of the main characters is only distinguished by their color of hair and for their signature color – En is blue, Atsushi is green, Ryuu is pink, etc. – while in “Battle Lovers” mode. The same can be said for the student council members; each is refined and effeminate when compared to everyone else. 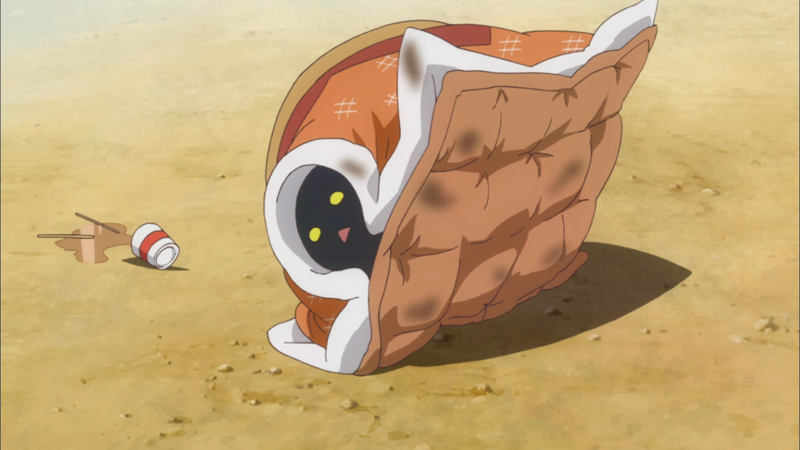 The monsters that appear are quirky but such designs work well with the comedy of the show. For instance, the super-handsome, ballerina man becomes a “Black Swan” whereas the creepy, grade-loving nerd becomes a screw due to the ones he apparently has loose in his head. Like the conversations, each isn’t chosen out of thin air; their designs are based on the issues they are facing before they become these evil creatures, proving that there was a nice amount of attention placed here outside of just a variance in color. Actual animation is somewhere slightly below average. Much of the show has the group of guys talking among one another at length. Meaning, lots of sitting without much movement is had. Even when they are taking part in their fights, the variance in abilities is so minimal that the show chooses to reuse the very same scenes as much as it can, highlighting its inability to animate what needs animating. Much of the cast of Earth Defense Club has nothing else about them besides the personality shtick they each hold. Ryuu loves girls, Io loves money, Yumoto loves to cuddle, En loves to do nothing, and Atsushi loves to be friends with others. Even the student council members have their own loves. The word love is being used frequently here on purpose; it’s the whole point of the anime to make it abundantly clear that there is not only someone willing to give love but also something to love as well. As the introduction stated, there exists parts of the world around us that we don’t particularly like all that much, even if it happens to be irrational. And the students who become the monsters throughout the series have their hatred manifested, but it’s always trumped by the love the club (albeit forcefully) brings to these despondent individuals. In other words, love isn’t an emotion that is lost once less-than-happy feelings are acquired. It’s always around us; it just takes a bit of understanding – and perhaps a joint magical effort – to make said love come true. As for individual character exploration, the anime fails to do this properly. And quite often when it is attempting to have the cast be more than their singular trait it comes off as poorly handled. 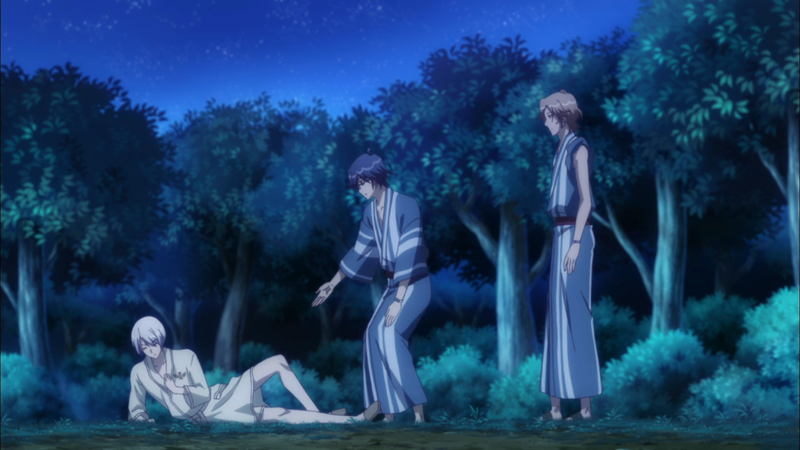 A situation like En and Atsushi feuding lets us witness the “power of friendship “ – which is itself another parody – is fun, but doesn’t do much for the characters outside of having them realize what they knew all along. And it’s this constant return to the status quo that makes it impossible for the characters to see any sort of important growth. Reiterating at this point, but the repetition that is always used once again prevents the show from giving the guys any sort of meaningful focus since it always ends up the exact same way: small talk in the beginning, fight monster to save them, and end up taking a bath together. Arguably, though, there is a character that does see a change in his person that does follow along with the parody elements of the anime. Kinshirou Kusatsu, the student council president, joins the forces of evil to gain the title of “Chevalier White.” His motivations are left clouded for nearly the entire time outside of hating that which is foolish, wanting to eradicate anything that, to him, is a blemish on this planet. 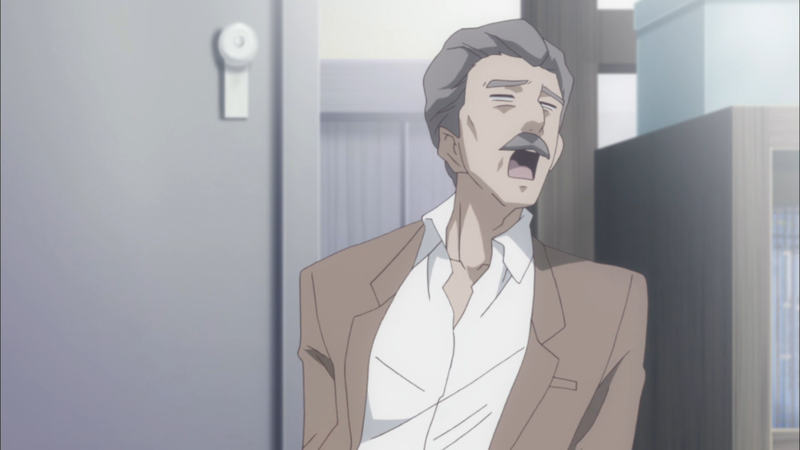 While his behavior is quite arrogant, there are hints of something kinder: the ending theme and specific parts of the show reference a previous relationship between him and Atsushi. Everything eventually comes to light; Kinshirou believed to have lost his friendship with Atsushi thanks to some curry, holding a years-long grudge against his previous best friend. It’s absolutely silly that their division was caused by a simple meal. This not only reinforces the notion that we as people have some rather strange dislikes but also fits snuggly within the confines of the anime’s already ridiculous premise and direction. Once this massive misunderstanding is cleared up, the show continues down its parody path: the two groups come together to save the Earth from destruction. In the end, everyone lives “happily ever after,” with no amount of curry being able to change this. The opening theme is actually surprisingly catchy after listening to it quite a few times. The clapping and group-singing work with the orchestral instruments to give a track that is pretty generic but oddly fun to listen to. While it doesn’t cause one to “fall in love” with the piece itself, it’s at least not as lame as much of what the anime normally offers. The ending theme is split; the latter half is pretty interesting due to the increased emotion put behind it but the first half is somewhat slow and boring. But that’s sort of the point: it’s in essence, and as was discussed slightly earlier, a “love song” from Kinshirou to his former friend Atsushi. Sadly for the track, though, nobody is going to be missing it any time soon. The soundtrack is rather forgettable, being used mostly for simple background music as opposed to setting any sort of mood or being worthy of a replay. The tracks themselves are usually calm and dainty during downtime and magical sounding when the guys embark on their escapades. But nothing in particular is significant and the music isn’t lovely to hear, making it a less-than-stellar OST overall. As far as voice-acting is concerned, the performances were average at best. A special shout-out is deserved for Kazutomi Yamamoto as Yumoto for his somewhat feminine voice for the peppy, happy-go-lucky, and always energetic kid. When first getting into this one, I knew it would be strange. I can’t say I’m a huge fan of the “magical girl” genre, but the show did its best at making it funny and comedic. The novelty though quickly wore off the further along it went, with the “same” enemies being dealt with and having to sit through Yumoto’s grating personality. Many of the jokes rarely brought about laughter because everything else around it was just not good. However, there was one, recurring joke that usually managed to make me smile. And that was Mr. Tawarayama. When the show often forgot or remembered him, combined with his sickly status, it made for some pretty entertaining scenes. Better still were the tongue-in-cheek reminders of his condition when the show would pan over the clubroom with their teacher slumped over in the corner not doing much of anything because he was quite literally dead. The final joke was even based on the teacher, giving the anime as funny of a send-off as it could hope to attain. Binan Koukou Chikyuu Bouei-bu LOVE! is a pretty intriguing parody that is unfortunately dragged down by everything else around it. The characters are weak, the art is lackluster, and the music is not worth mentioning. Despite all of the love the Earth Defense Club provides, this one does not get, or deserve, love of its own.